Petrus is a cute grey tabby who was handed into Spring Corner Vets as a kitten, he was in poor health with a skin condition. He’d scratched most of his fur off and was very skinny. Spring Corner nursed him back to health and asked Pause to take him in. Petrus and Hazel have a strong bond and love spending time together. Initially, Stephen had planned to attach the ring around a collar on Petrus’ neck, but the cats in the cafe do not usually wear collars and as Petrus was stray, he’s not used to wearing a collar. Stephen knows the cats well and could tell that Petrus wasn’t keen, he didn’t want to cause Petrus any distress so he had to rethink his approach. Each cat has their own individual bedroom at the cafe, protected by microchipped cat flaps. This enables them to get away from visitors or other cats whenever they want some me-ow time. Stephen waited for Petrus to retire to his bedroom, placed the ring box alongside Petrus and asked Hazel to check on her favourite cat. Luckily she found the box right away and Stephen got down on one knee to ask for her hand in meowage. The rescue cats who live in the cafe are attended to 24-7, with kind volunteers looking after them throughout the day and taking it in turns to stay overnight with them. Hazel and Stephen stay one night a week and Stephen chose this Friday night to pop the question, although he has had the ring for a while and had been thinking about the best way to make the pawposal. It was worth the wait, because Hazel said ‘yes’, and said she couldn’t think of a more purrfect way to have been asked. The cat cafe volunteers, now both 22, came to Bournemouth separately for University; Hazel was studying Archaeology, Anthropology and Forensic Sciences and Stephen was studying Archaeology. Their eyes met across trowels and mud in an archaeological dig in their first year, they shared some lectures and started dating the following November. 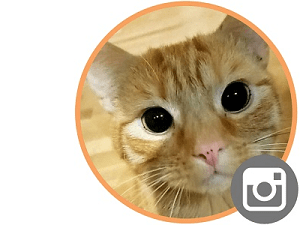 One of the couple’s first dates was at the cat cafe, and Hazel loved it so much that she started volunteering at Pause Cat Cafe shortly after. Since then she has tried her hand at every aspect of the cafe, from waitressing and making coffees to chef duties, but her real passion is looking after the cats and she now supports and trains the other volunteers to provide the best possible care for the rescue cats. Stephen started spending time at the cafe with Hazel and soon fell in love with the cats too, officially joining as a volunteer at the start of 2018. Hazel and Stephen are both delighted and have been showing their ring to the people and cats in the cafe. 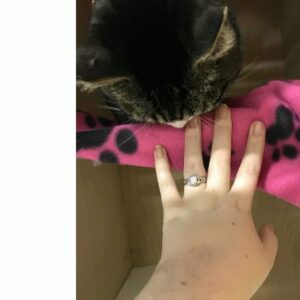 They have already set a date for getting meowied and have made good progress in planning their special day in just a few days since the engagement! 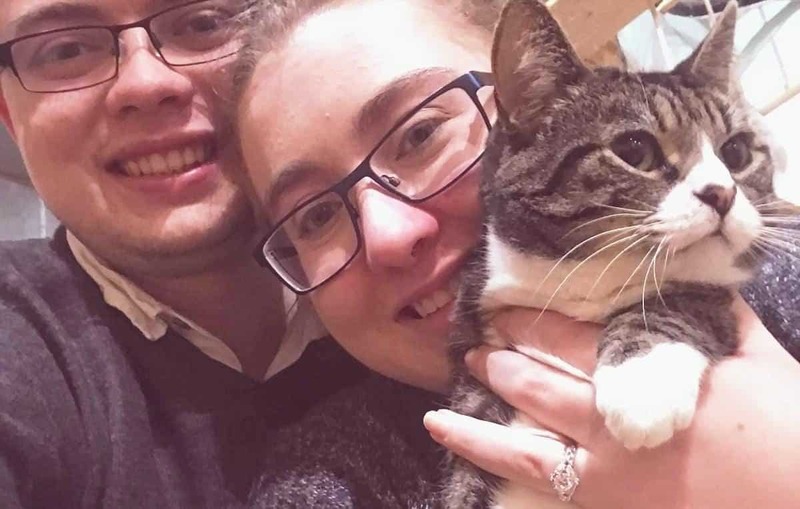 It was pawdictable for Stephen to choose the cafe as his place to propose, as it has been such a big part of the couple’s lives during their time in Bournemouth, both have remained in the town since graduating saying they can’t bear to leave the cats yet. “Petrus gave us so much attention all night and refused to leave us alone after Stephen proposed. Soon all the cats cottoned on that we were so excited so they became super excited but didn’t know why. We had hyper cats for about an hour! 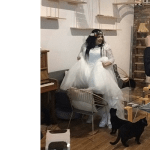 Pause cats are no strangers to romantic tails and this isn’t the furst time the cats have been involved in ‘meowage’ festivities, as one cat-loving bride and groom came to visit on their wedding day last summer. The cats were very intrigued by the wedding dress, they aren’t used to seeing anything fluffier than them at Pause! Everyone at Pause wishes the happy couple a purrtastic future filled with plenty of cuteness fur many years to come! If you are on board with our mission of kindness and can think of a kitty lover who might enjoy a little smile break, then purrlease help us to share the love. Refurr a friend to sign up to The Mewspaper and you can even earn points to spend on cool cat stuff! Contact us if you’d like your own unique refurral code or share the link above for regular smiles delivered with love directly to your inbox.